The United States and Nigeria have commenced bilateral negotiations on prospective to bring down barriers limiting trade relations between the two countries. 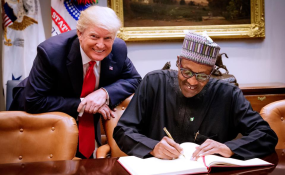 United States President, Donald Trump, disclosed this in Washington DC on Monday while hosting his Nigerian counterpart, President Muhammadu Buhari, who is on working visit. Mr Trump said the plans to remove the trade barriers between Nigerian and the United States was part of a larger plan by his administration to expand trade and commercial ties with African nations to create jobs and wealth. "The United States is currently working to expand trade and commercial ties with African nations, including Nigeria, to create jobs and wealth in all our countries," Mr Trump said during a joint press briefing after a private meeting with President Buhari at the While House. "We hope to be the economic partner of choice for nations across the continent and all around the world. Nigeria is one our largest partners in the region. We look forward to growing our trade relations based on the principles of fairness and reciprocity," he said. He described Nigeria as "a valued and good friend", saying he looked forward to working with President Buhari to deepen the cooperation between Nigerian and the US as well as forge even closer partnership. "US is committed to working alongside Nigeria as we seek a future of strength, prosperity and peace for both our countries," Mr Trump told Mr Buhari. Mr Trump who noted that the US government has been giving Nigeria over $1billion in aid every year, pledged to do more. He commended the Buhari administration for the several steps taken to fight corruption and improve Nigeria' Business climate. He said these measures by the government would make it easier for Nigerian and US companies to invest in the Nigerian economy, assuring that his administration would be committed to investing substantially in Nigeria if that level playing field could be created for the two countries. "US deeply values and appreciates Nigeria's role as a strong democratic leader in the region. I thank President Buhari for Nigeria's leadership and partnership in the fight against terrorism. He's been a real leader," Mr Trump said. He acknowledged the contributions of Nigeria to the effort to combat terrorism in African, noting that apart from Nigeria being one of the first African nations to join the coalition to defeat ISIS, the Nigerian forces are currently leading regional efforts against ISIS in West Africa. Besides, he said Nigeria was also leading African nations in the fight against Boko Haram, another ruthless jihadist terrorist group that has killed several innocent civilians and kidnapped thousands women and children. Mr Trump assured that the US government was committed to combat both jihadists' terrorism groups and smuggling throughout the world, particularly in Africa . "US is helping Nigerian partners by facilitating intelligence cooperation and providing training and military equipment to Nigerian forces, including the recent decision to sell 12 US A29 military aircrafts, the first ever sale of American military equipment to Nigeria to improve the country's ability to target terrorists and protect civilians," he said. He expressed concern with the spate of religious violence in Nigeria, particularly the burning of churches killing of innocent civilians and persecution of Christians and urged the Nigerian government to take steps to arrest the situation. "We encourage Nigerian leadership, the federal and state governments to do everything in their power to immediately secure the affected communities and protect innocent civilians, including Moslems and Christians. In His response, President Buhari commended the US President for his leadership in the effort to bring peace around the world, particularly between North and South Korea, saying he was looking forward for similar support to Nigeria to combat the menace of terrorism in the African region. The President said Nigeria would be ready to partner with the US government to remove all barriers hindering trade relations between the two countries to promote their economic development between the two countries.